Not The Barnet Times: Coleman tries to keep his expenses secret! Following the MPs expenses scandal, all politicians now accept the need for greater transparency of their allowances. All except Barnet’s favourite Luddite, Brian Coleman. 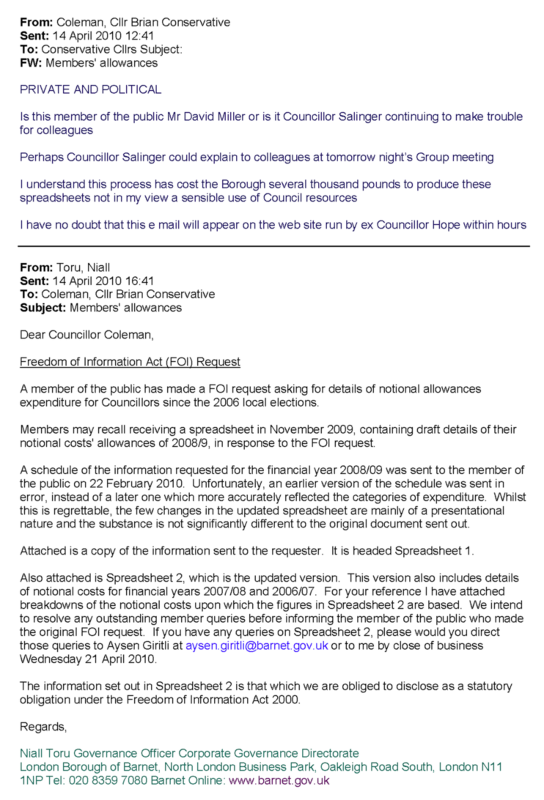 In an astonishing e-mail sent to his council colleagues, Coleman challenges members of the public who dare to exercise their legal right to information, and he has the temerity to blame Cllr Brian Salinger for “making trouble”! Is this the same Brian Coleman who regularly undermined former leader Victor Lyon by leaking anything and everything to the press when it suited his needs? 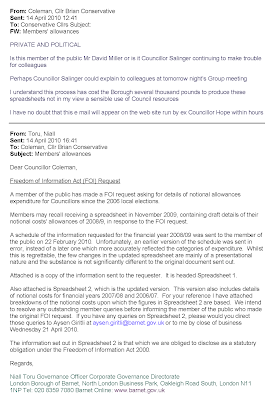 The correspondence below (click to enlarge) shows that Coleman received an e-mail from a council officer expressly stating that the request for information came from a member of the public. Don't Call Me Dave believes that Brian Coleman has deliberately defamed Cllr Salinger, as part of an ongoing vendetta, by his demonstrably untrue accusation. Councillor Coleman is seemingly unaware that the Information Commissioner’s model guidelines, which came into force in January 2009, state that this type of information should be published by councils automatically, thereby saving time in processing Freedom of Information requests. Much as he likes to throw his ample weight around, Brian Coleman should reflect on the words of the council officer: “The information set out in Spreadsheet 2 is that which we are obliged to disclose as a statutory obligation under the Freedom of Information Act 2000” (emphasis added). The law is the law Cllr Coleman. If you don’t want the public knowing how much you cost us through our hard earned taxes, go and find yourself a job in the private sector. If anyone will have you. For residents who would like to know what Cllr Coleman is trying to hide, click here. As a responsible blogger, DCMD has redacted Cllr Coleman’s telephone account details which he foolishly passed on to the whole world when he sent his ill conceived e-mail. When the Standards Committee found Cllr Coleman guilty of a breach of the Members Code of Conduct, didn’t they instruct him to undergo training in the use of the council’s e-mail system?